Laying off your employees is sometimes an unavoidable cost of doing business. There are some ways to take the sting out of the message, though. Follow these tips to help smooth the transition and prevent ill-will. Never tell your employees that they are being let go for any reason in an open or staff meeting, email, or in a memo. Treat your employees with dignity and respect; a supervisor or someone from upper management or human resources should sit down personally with each employee individually and explain to them why they are being let go. Being laid off hurts; being treated like cattle hurts even more, and it will hurt the reputation of your company. When you let employees go, do not let them go empty-handed. Give them printouts for resources for employment counseling, unemployment, job training, and local small business development organizations. If you offer health insurance benefits, 401K Plans, etc. be sure to provide information about COBRA and any requirements or restrictions on transferring retirement accounts or other savings. Because losing a job can cause emotional turmoil, you might also consider including contact information for a suicide or depression hotline. Providing information and contacts for other employment prospects shows that you care what happens to someone after they leave your employment. Think about the person you are letting go and your industry -- will it be hard for them to find new work? That is likely the first thing terminated employees think about after being let go. If you let people go without any prior notice on a Friday or the day before a holiday the former employee cannot even make calls to begin networking for a new job. 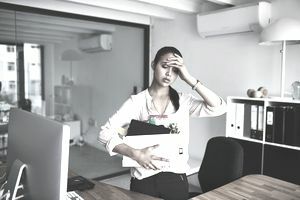 Employees who have been let go on a Friday tend to stew over their situation (especially if they are used to working in a corporate Monday-Friday work environment). When laid-off workers cannot begin making calls about other jobs they are more likely to become depressed, commit suicide, or angry enough to act out in vengeance against an employer when laid off later in the week or just before a holiday. Statistics show that people adjust better to changes in employment when told as early as possible in the work week when depression and suicide are considered. Suicide statistics rate Wednesday (24%) as the day someone is most likely to take their life with Saturday and Monday tied for second place (and more people end the lives in springtime more than any other season). Perhaps this is why Best Buy lays off most workers on Tuesdays; so frequently, in fact, that employees now refer to all Tuesdays as "Termination Tuesdays." When to lay someone off is a decision that needs to be made on a case-by-case basis. However, the consensus among human resource experts is to avoid Friday layoffs and to terminate people mid-week to allow them a couple of days to regroup before the weekend hits. Never let someone go without at least two weeks' notice (one month is even better) or without giving them severance pay. As an employer, you have some responsibility to consider the financial hardship that might be created for any employee you let go (except those who are fired for company violations or poor job performance). It is difficult enough for someone who loses their job, but when they lose income without warning and cannot find other work, they may lose health care benefits, a car, or even their home. If your company can afford to offer severance pay, do so. If you cannot afford to offer a severance package, always try to give advance notice to employees that their job is being eliminated. The “rule of thumb” is that it takes an average of one month for every $10,000 a worker earns to find a new job. In a difficult economy, it could take 2-3 times longer. Most companies will also pay out any unused sick or vacation time in addition to severance pay. You cannot predict how someone will take the news that they are being let go. Some employees are stoic, while others may cry, become angry, or even make threats. When you sit down with someone to let them know that they are losing their job, make sure someone else in management knows you are meeting with that person. If you have any hesitations about letting someone go, have another management employee sit in the room with you for support (for you, and the employee). Give the employee an “exit interview” either face-to-face or on through an Internet resource. Exit interviews are usually questionnaires that may be used to gain information about how a company can improve its work environment and retain more employees, but exit interviews also give unhappy employees a chance to vent, and in some cases, even find closure after a job loss. Employees who have devoted their work life to help you meet your business objective should be treated with compassion and a show of appreciate if you need to let them go. How Can You Work Peacefully Alongside Your Spouse? Twitter vs. Facebook: Which Is Better for Your Business?